Everyone has had bad customer experiences, and few of us return to do business with companies that treat us poorly. The success of any company, including a recruiting firm, hinges on strong, positive client relationships. A recent study found that 13 percent of customers will tell 15 or more people about a negative experience with a brand, while 72 percent will share a positive experience with six or more people. Fifty-one percent of customers will never do business with a company again after a negative experience. That’s why you have to put your customer first in all that you do. As a recruiter, your job is to help clients acquire the best talent for their organizations. It’s not about paychecks or contracts — it’s about adding value to your clients’ businesses, products, and services by going above and beyond. Clients will remember when you come through for them. Staying on top of your game and consistently meeting your clients’ needs establishes your organization as reliable, and reliability goes a long way in building trust with your partners. Plus, going the extra mile for one client may open up additional streams of revenue. 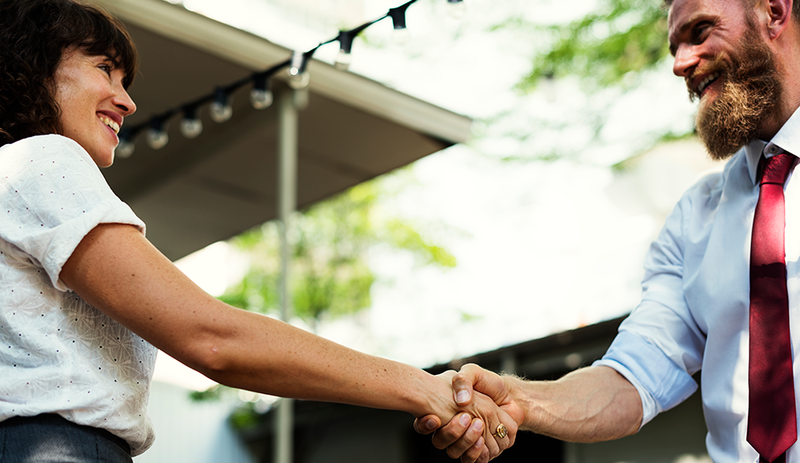 Clients that trust you are more likely to recommend you to their contacts, with 83 percent of customers being willing to refer others to a company after a positive customer experience. Happy clients are more likely to stay with you and make positive referrals. Sounds simple, right? However, only one in every 26 unhappy customers makes a complaint. There is a strong possibility that some of your clients may be unhappy about your services without you even knowing it! These clients could choose to leave at any moment. This is why it is critical to treat every client like your most important one. Even those companies that don’t seem important could one day become major players in their industries. Plus, you never know whom your clients might know. News of their experiences with you, both positive and negative, can reach a wide audience. Don’t miss out on potential business opportunities by failing to treat every customer with respect! Strong client relationships take time. Resist disingenuous schmoozing. This can be a huge turn-off to new clients. Take time to get to know your new clients in an authentic way. Remember: Relationships are a two-way street, so help your clients get to know you as well! Your work for your clients is paramount in building a positive relationship. This may seem obvious, but at the end of the day, no amount of charm can substitute for high-quality work. Excellence begets excellence. If you give excellent service 100 percent of the time, the world will see your business as excellent 100 percent of the time. The work you do will speak for itself when attracting new clients and strengthening relationships with existing ones. Keep up with the ins and outs of each client’s company and industry, including the latest tools and trends. You do not need to be an expert, but you should be able to speak the same language. Knowing a client’s industry will help you understand what keeps them up at night and how you can help. Not only will understanding your clients’ organizations and industries make you look like a knowledgeable partner, but it will also help you better cater to your clients’ needs. You will be able to help clients tackle talent challenges head-on — a win-win for all. Sometimes, a simple acknowledgment is all you need to show a client they are important to you. When you receive an email from your client, acknowledge that you have received it as quickly as possible, even if you do not have the answer right away. Let them know that you are on it, and include a time frame of when you expect to have the information for them. This may seem like obvious advice, but some recruiters worry about having the correct answer. As a result, they will put off acknowledging the email until they have a perfect response. Most of the time, your client simply wants to know that you received their message. They do not expect you to have a well-thought-out response the moment you get the message. Email may be the most prevalent form of communication in business today, but it’s not a perfect medium. Email can often be misconstrued, especially in times of stress. Tone can be hard to read in an email, leading to confusion or even relationship harm. You don’t have to abandon email altogether, but an occasional phone call, video chat, or in-person meeting can help you and your clients get to know each other better. This is an easy one to miss. No matter how quick or trivial a client meeting seems, always make a point to recap the conversation and outline the next steps in your partnership. You may know you’ll remember every detail, but that may not be the case for your client. Recapping what was said in a meeting will help ensure all parties are on the same page, and it will give you and your client the opportunity to clear up any misunderstandings. Customer experience is the new battlefield. Today, 89 percent of companies see customer experience as a key competitive differentiator; compared to 36 percent in 2010. Recruiting firms are not exempt from this new paradigm. Those that take their client relationships seriously will rise above the rest.